The fuel tank that came from under the car was closely examined too. At first sight there was nothing wrong with it, but a little clean up couldn't do any harm, even if you couldn't see anything afterwards when it was installed back under the car again. So all the parts, like the fuel sensor, pump and the filler neck, were taken from the tank so they could al get a good cleanup. 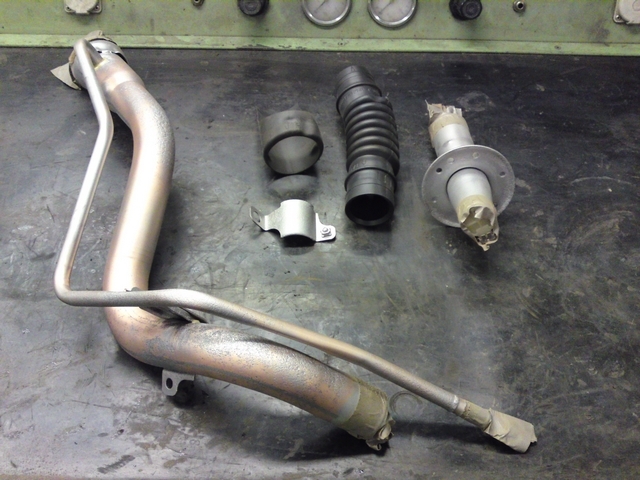 The filler neck as it came from the car on the left and in pieces on the right after being sandblasted. 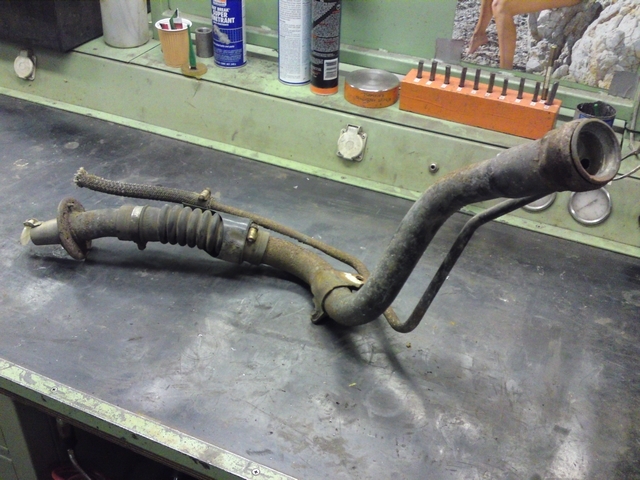 There was some superficial rust on the filler neck, but it was already eating into the metal. So I caught it in time and after a bit of sand blasting, it was all gone. 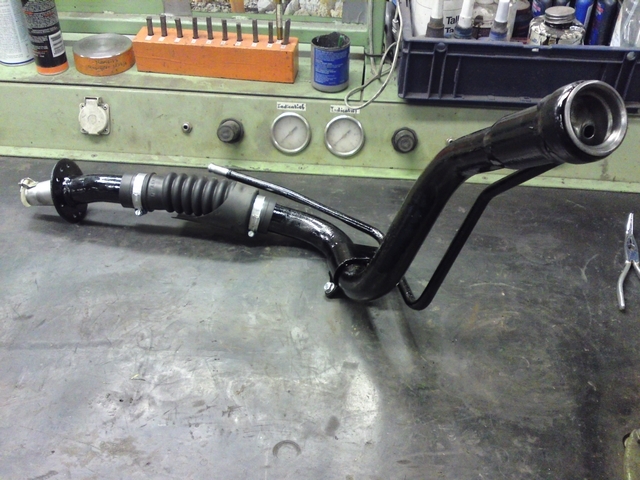 I then coated the filler neck with a tar based paint called Apexior. This is often used in ships as it can withstand salt water. Hey, if it works for ships at sea, then it will certainly work for the underside of my car. 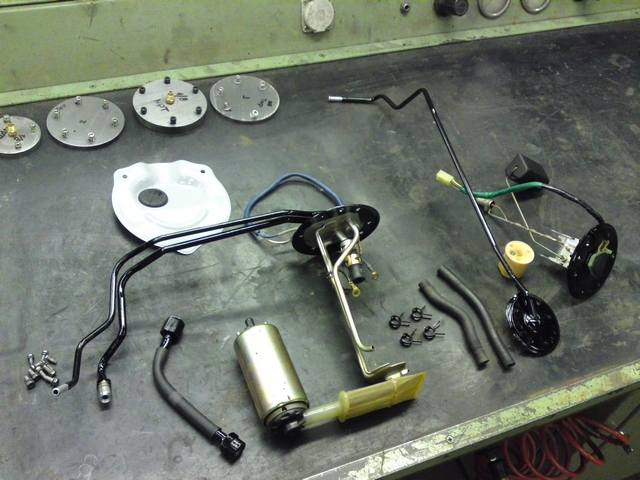 A few parts had to be taken from the fuel tank before I could do anything to it. They are bolted to the tank with a few flanges. 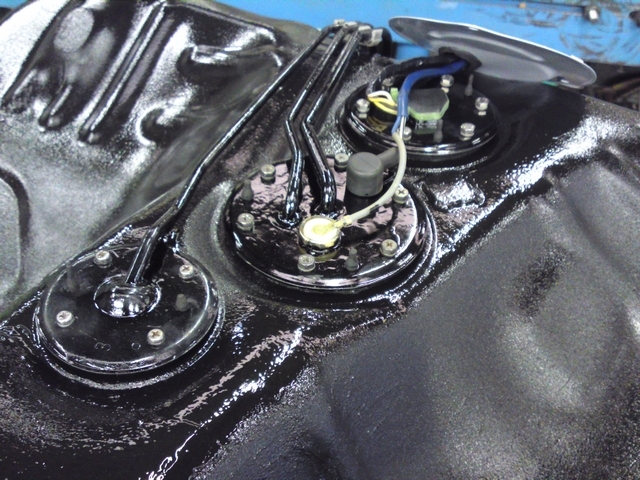 From top to bottom these are: fuel tank breather, the in-tank fuel pump and the fuel level sender on the bottom. 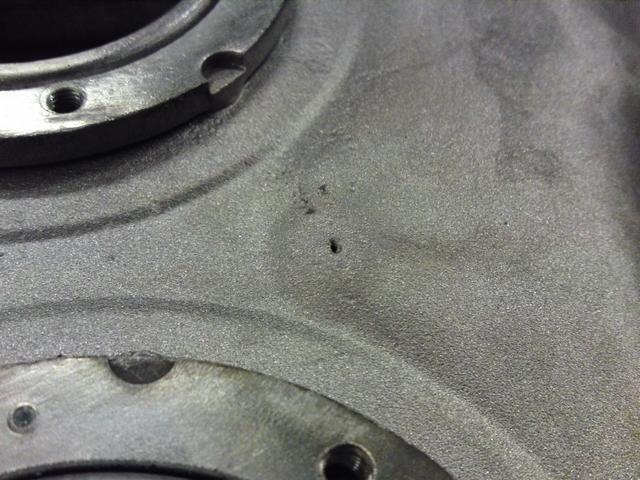 And these were cleaned and treated against corrosion as well. 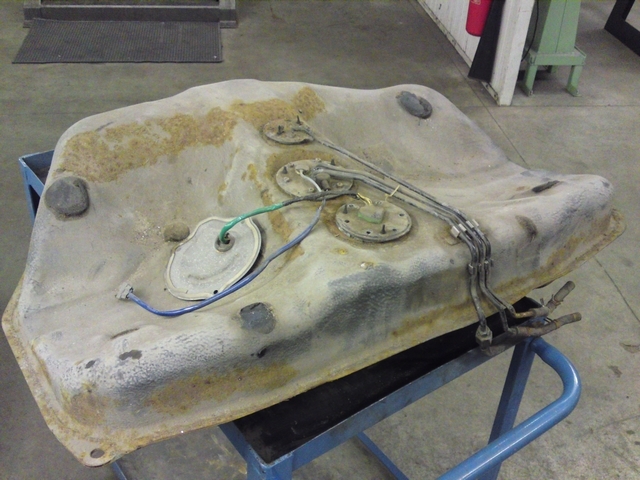 The tank was now stripped from all its parts, bit it still had a very thick coat of undercoating on the outside. 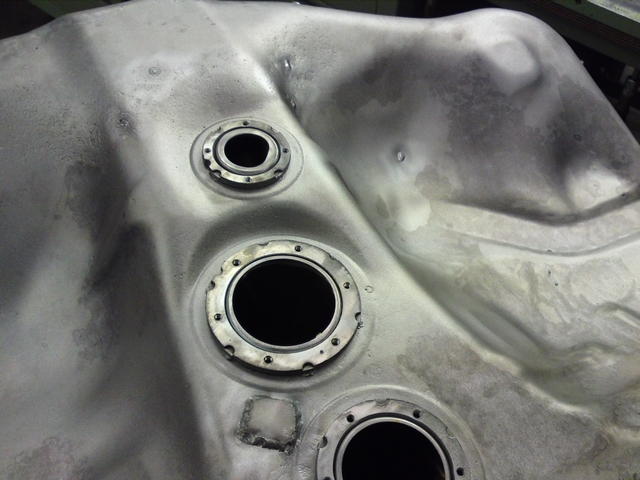 And because I wanted to check the tank for corrosion, I had to strip it down to bare metal. So I taped and blocked off all the openings of the tank with a few layers of duct tape and hang the tank in the large blasting cabinet at work. This hurls thousands of little metal balls at the object that has to be blasted and is usually very efficient at stripping old paint etc. from objects. But it took a few round in this blasting cabinet before it was stripped back to bare metal. But when this was done, I was very glad I had done it. 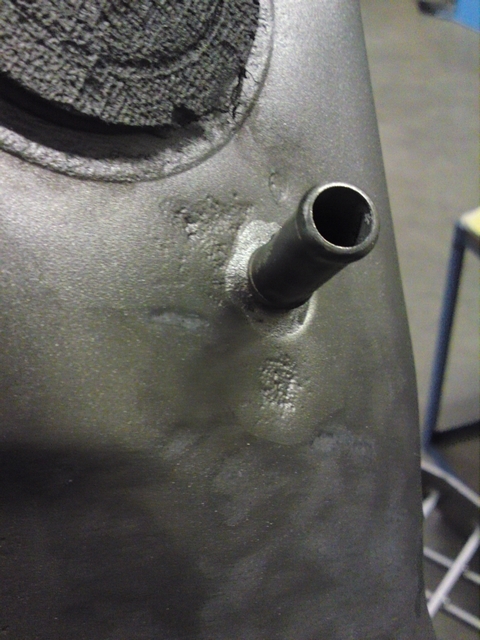 Because it turned out that underneath that thick layer of undercoating corrosion was already slumbering and had even caused a few little holes in the tank! I surely didn't expect holes in the tank and how minute they were, it was something I really didn't want for my fuel tank. Fuel vapor is very volatile and extremely flammable and under a car, where a hot exhaust runs very near to the fuel tank this just isn't an option. So it had to be fixed. The smallest holes were simply welded shut, but I welded a larger metal ring around the larger corroded area around the fuel inlet pipe to get rid of the corroded area that had affected it's base. 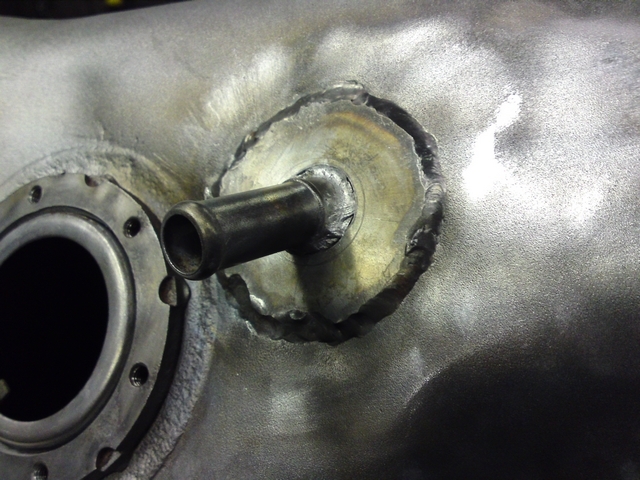 The repairs made to the fuel tank. That should seal the holes up again. 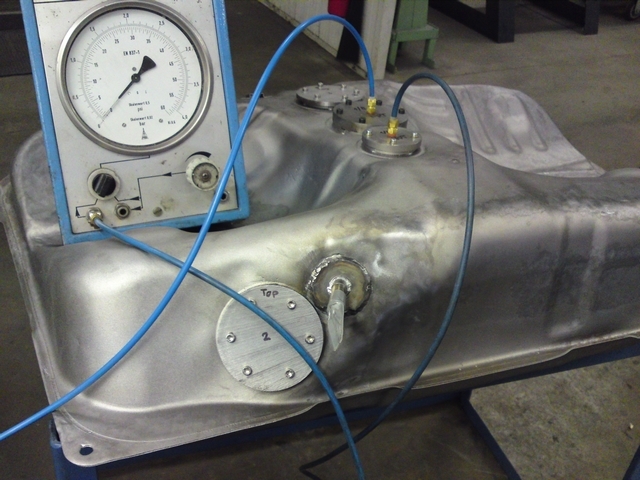 But to be absolutely sure that the tank was 100% air tight again I wanted to submit the tank to a little pressure test. I made a few flanges and gaskets to block off the holes and two of the flanges has connections in the so I could hook them up to a air supply and a calibrated pressure gauge. This way, I could measure what the pressure in the tank was. 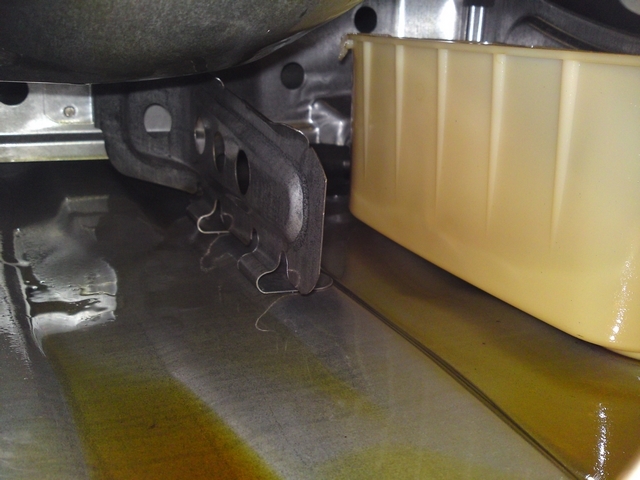 The fuel tank is made of thin metal with very little structure to it, so it is not meant to withstand much pressure. In day to day operation the tank can't even build up any pressure due to the breather connection. 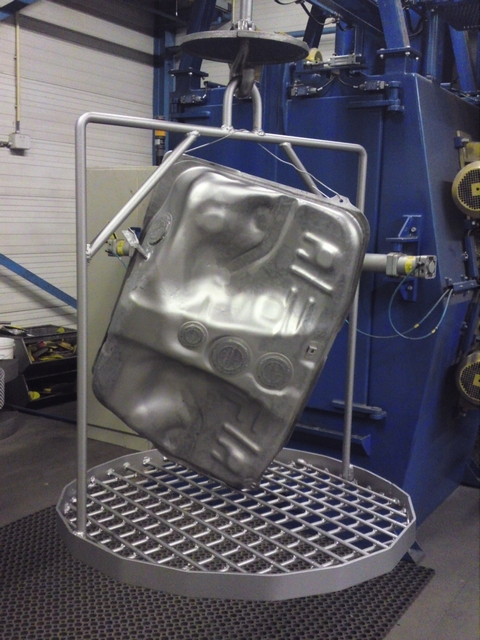 Because the tank does contain quite some volume (about 50 liters) it didn't take much pressure to let the tank expand, it already started to expand so much that at 1 psi I was already fearing the tank would burst or pop open a weld seam. Pressure is pressure even if it's only 1 psi so I already stopped there and see if the pressure would hold or drop. If it were to drop that would mean that the tank still leaked air somewhere. So I sprayed the tank with leak detector spray to see if there were any air bubbles at the patched up spots and around the seams of the tank. But the tank held its pressure and there were no leaks to be found. So I was positive the tank was properly repaired and was safe to go under the car again when ready. The inside of the tank was checked as well. 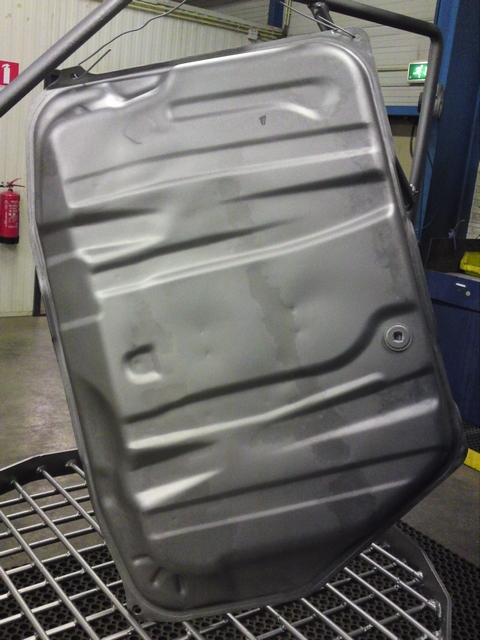 When left standing still for long periods of time, fuel tanks can rust from the inside out because modern fuels have certain additives that cause rust on metal tanks. But there wasn't even a trace of rust on the inside of my tank which even looked nice and clean. 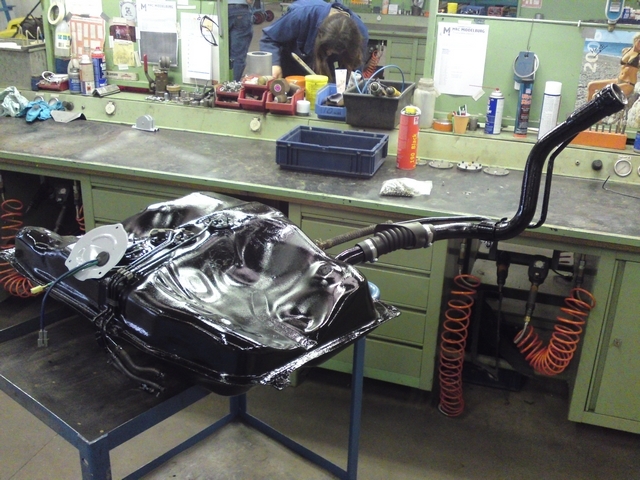 Now the tank was ready to be conserved again and coated with two thick layers of bitumen under body coating. 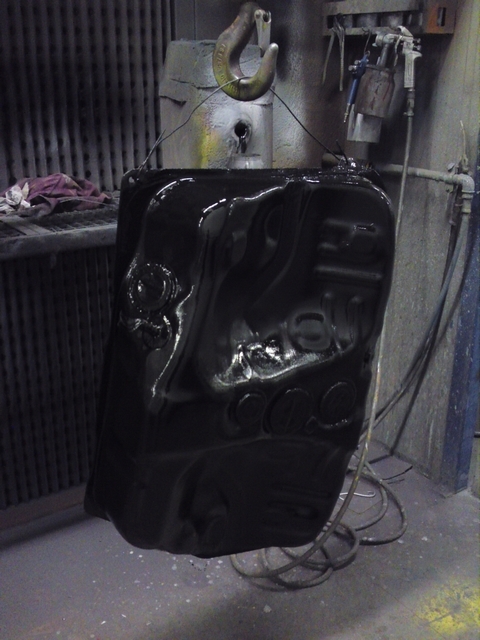 And then I sprayed on two more layers of the tar based Apexior for good measure. And when the paint was dry, I reassembled the fuel tank. Now it's ready to hold fuel under my car for years to come.